MOUNTAINS have played a central role in Zimbabwe’s indigenous culture and the armed struggle. The mountains are sacred places; chiefs live on top of them and are buried in the caves that are at the bottom of the mountains. In the mountains there are also sacred groves, which are passages underneath the mountains known to link the hills and mountains throughout the country. These groves are bigger than the caves, and are where the most important rituals and ceremonies are held. Mountains are also a habitat for wildlife, including animals that are sacred for the indigenous people. Mountains are the source of our life, and where we communicate with the spirits. The indigenous African cosmovision consists of three worlds: the spiritual, the natural and the human, and of the relationships between them. It is common belief among the indigenous people that if the proper rituals and ceremonies are performed, the spiritual world rewards the natural world with good rains, good harvest and food security; while if the traditional values and norms are not upheld it can bring famine, war and diseases. 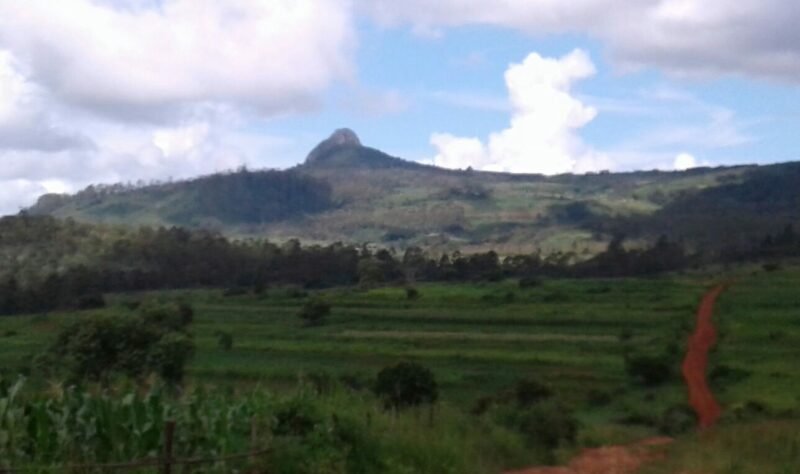 (A case in point is the disappearance of a tourist in Mount Inyangani in Manicaland province where the Tangwena clan was heavily consulted on the way forward.) In most rural areas in Zimbabwe, mountains are still revered and held sacred. Special rituals are performed in times of trouble, although the rituals and ceremonies vary from community to community the most common ones are the mutoro (rain making ceremony). The ritual is performed under the muchakata tree under the foot of a hill of a special mountain. Then there are cleansing ceremonies where people afflicted with bad spirits or mashavi are taken to the mountains and cleansed of the spirits. A goat or black hen is driven into the mountain where it wonders with the spirit. These animals and birds may later procreate and become many, but they are not touched or eaten as they are believed to belong to the mountain. Those who dare eat these animals get mentally unstable or die. The mountains as sources of food such as wild mazhanje, mushrooms and other edible wild fruit are respected during the fruiting season, usually elderly women in certain communities are the first ones to pick the fruits, then everyone else is allowed to go into the mountains. They can only go there under strict instructions that they should not over harvest and should leave some for the spirits of the mountain. Mountains also play a significant role in informing the community that the spirits need to be appeased. When elderly villagers see certain signs such as the mountain burning by itself; they know that it is time to prepare for the next cropping season. They brew traditional beer and gather at special caves in the mountain and appease the spirits. Then there are times when the entire mountain is suddenly engulfed by mist, elders will consult masvikiro on what is about to befall their village and they then act according to the advise they are given by the diviner. Perhaps some of the notable roles played by mountains was during the liberation struggle where comrades sheltered and also carried out their planning activities. Groves and caves in the mountains were also used as safe hiding places and tombs for the fallen comrades. Reports of white soldiers disappearing in the mountains are common among most rural folk where the war was waged. As a result, they tried by all means to desecrate the mountains in order to kill the spiritual link between the people and their ancestors. Colonialism had a devastating effect on the preservation of the mountains. People were removed from their land and confined to reserves, including the chiefs, who were formerly living on the mountains. This was meant to destroy the communication between the people and the spirits, as the mountains were the sacred places to do so. Also, the white settlers brought Christianity with them, forcing baptism and placing most of the missionary schools on top of the mountains, in order to control the power of the indigenous people. The result of the colonial period was the extreme degradation of cultural values and beliefs, but also the physical degradation of the mountain sacred places and biodiversity. It is widely believed among the indigenous people that this led to famine, unnecessary drought and spread of diseases. Great Zimbabwe, the ancient city that was crucial for the development of the Shona state and today is one of the most important archaeological sites in Sub-Saharan Africa, was situated among a complex of rocky hills and valleys. After the decline of Great Zimbabwe, all the chiefs spread all over Zimbabwe, but they all followed the pattern of settling on a mountain. In an attempt to reclaim the glory of mountains in the country, shortly after Independence, in 1985, the Association of Zimbabwe Traditional Environmental Conservationists (AZTREC) was founded by the tripartite relationship between chiefs, spirit mediums and war veterans, with the aim of recovering African knowledge systems. The AZTREC work focuses on an indigenous development of rural areas, from and for the local communities. It implements programmes in five areas: conservation of sacred mountains and wetlands, sustainable agriculture, local technology knowledge, traditional health delivery systems, culture and cosmovision. The AZTREC officials act as facilitators, counselling communities on how to recover their traditions and make use of them. Some of the programmes that the organisation is implementing are the recovery of local seeds and crop varieties, the rehabilitation of sacred caves and wetlands, the establishment of community laws to protect resources, or the recovery of traditional techniques which have been lost, like making pottery. In terms of the management of ordinary and sacred mountains, the association facilitates local communities to identify the cultural values of sacred mountains, to develop and implement action plans towards their management and to develop sacred sites into educational and eco-cultural tourism initiatives. Although there are really important cultural and spiritual relations between communities and the mountains, therefore for this reason, culture and cosmovision is crucial, and should be one of the most important issues to be taken on board by any action or policy involving mountain people. This also applies to the creation of an international network of mountain people, which should not forget about the spiritual and cultural dimension of the mountain communities. The world is changing, and there is need for recognition of every single culture. So far many development methodologies have failed for the simple reason of not considering the importance of local knowledge. All this will be achieved if the importance of the mountain in the indigenous culture, and of the spirituality behind it, is acknowledged.